Depending on the time of year, there is a festival called a Hanatouro. The website itself gives great information. 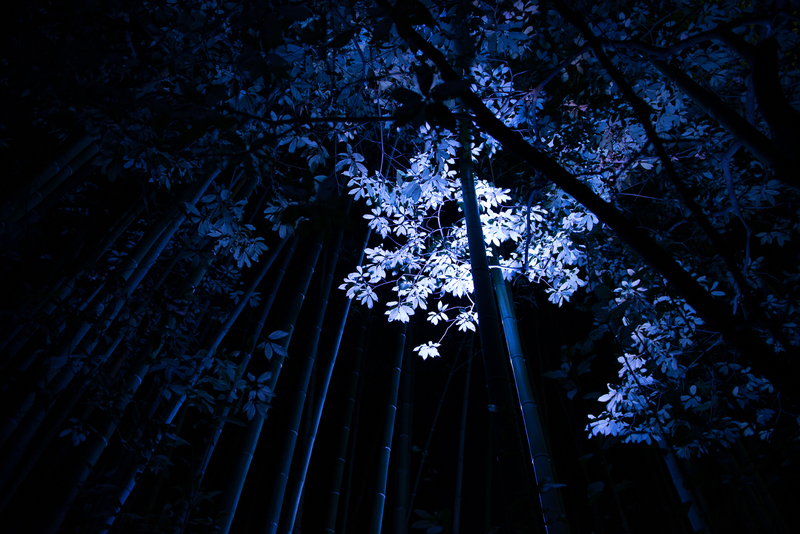 In 2013, I was able to attend the Arashiyama festival. While it was very cold in Kyoto in December, it was an amazing experience. While I do not fully understand the purpose of the festival, I can say it was a really amazing experience. There were so many people, street vendors selling all sorts of things for 100-200 Yen (about US$1-$2), and a fun energy in the air. You can walk around through the bamboo path, see many hundred year old temples, and other places of historical and cultural significance illuminated with powerful colored strobe lights. From the photography standpoint, there is no space to set up tripods. There were a few people who tried, but, I can’t imagine their tripods did not get kicked a lot. For me, it was a time to test what was my new camera’s high-iso capabilities. The image above was shot at iso 1000. Other images from this same night were shot as high as iso 5000.